California fisheries – and fishery participants – are managed by diverse state and federal regulations designed and implemented by several agencies. All commercial fishermen (captains and crew) are required to have a license from the state (renewed annually). In addition, nearly all fisheries require a fishery-specific permit. Similarly, businesses that purchase seafood from fishermen are required to have appropriate licenses and permits and to meet health and safety standards designed to ensure that seafood provided to the public has been handled properly. For information on how fisheries data are collected and analyzed, see the “Measuring Fishery Activity” page. Some species that move along the entire West Coast, such as sardines, are managed at the federal level even though they are caught primarily in state waters. In some cases (e.g., tunas, Pacific halibut, salmon), fisheries also may be subject to international management agreements, which in turn influence federal and state management. 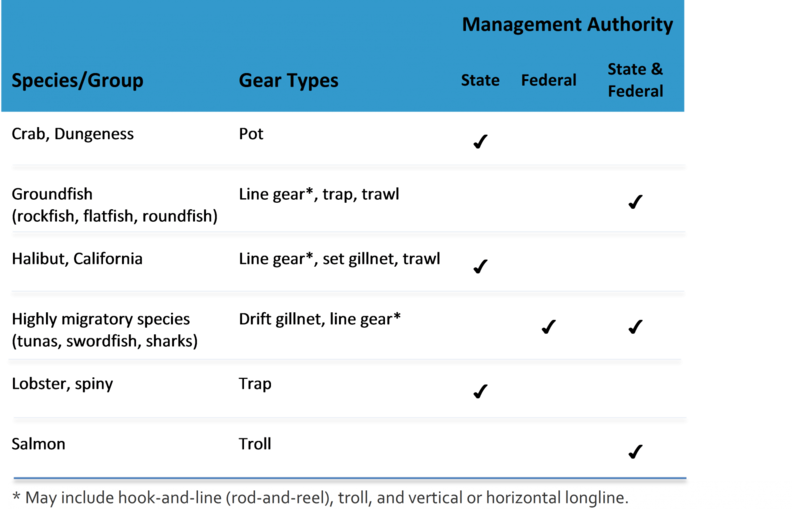 The following chart provides a few examples of California fisheries and associated management authority. The California Legislature and the California Fish and Game Commission (CFGC) establish policy and provide guidance to the California Department of Fish and Wildlife (CDFW) for management of the state’s fisheries (consistent with any federal fishery management plans (FMPs)). The Marine Life Protection Act (MLPA), passed by the California Legislature in 1999, provided for the establishment of a network of marine protected areas, including areas that prohibit some or all commercial fisheries. The Pacific Fishery Management Council (PFMC) designs management measures for fisheries that occur in federal waters along the coasts of California, Oregon and Washington. The Secretary of Commerce evaluates the measures which, if approved, are implemented by the National Marine Fisheries Service (NMFS). As mandated by federal and state policy, CDFW, CFGC, PFMC, and NMFS staff create and update FMPs for species (e.g., white seabass) or species group (e.g., groundfish) with input from scientists, fishery managers and stakeholders. While the state and federal processes differ somewhat from one another, both involve the analysis of biological, environmental, economic and social factors affecting the fishery, with development and modification (as needed) of management alternatives and regulations. As such, these documents cover a range of information including the history of the fishery, the biology and status of the fishery population(s), the socioeconomics of the fishery, and management alternatives. Each FMP undergoes public and agency review before it is approved and implemented. In some cases, state- or federally-appointed advisory groups, which include fishery participants and representatives of environmental non-governmental organizations and the general public, play an ongoing role in the management process. CDFW. 2014. California Fishing Regulations Commercial Digest 2014-2015. Sacramento, CA: The Resources Agency, CDFW, 129 pp. Leet, W.S., Dewees, C.M., Klingbeil, R. and E.J. Larson. 2001. California's Living Marine Resources: A Status Report. 4th ed. Sacramento, CA: CDFG, 562 pp. Wallace, R., and K. Fletcher. 2001. Understanding Fisheries Management: A Manual for understanding the Federal Fisheries Management Process, Including Analysis of the 1996 Sustainable Fisheries Act. 2nd ed. University, MS: Mississippi-Alabama Sea Grant Consortium.